Looking for a killer outfit to wear to your upcoming bridal shower, rehearsal dinner or wedding reception? Rock one of these oh-so trendy bridal jumpsuits. 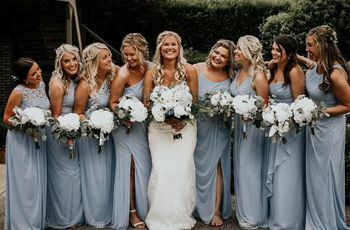 Bridal jumpsuits can be worn to any type of wedding-related function and are a popular choice for fashion-forward brides. The versatile all-in-one-ensemble is easy to move around in and can be dressed up or down to fit the style of your celebration. Not to mention, they create a seriously chic look. So, if you’re a bride-to-be and want to wow the crowd at your next big event, we’ve got you covered. 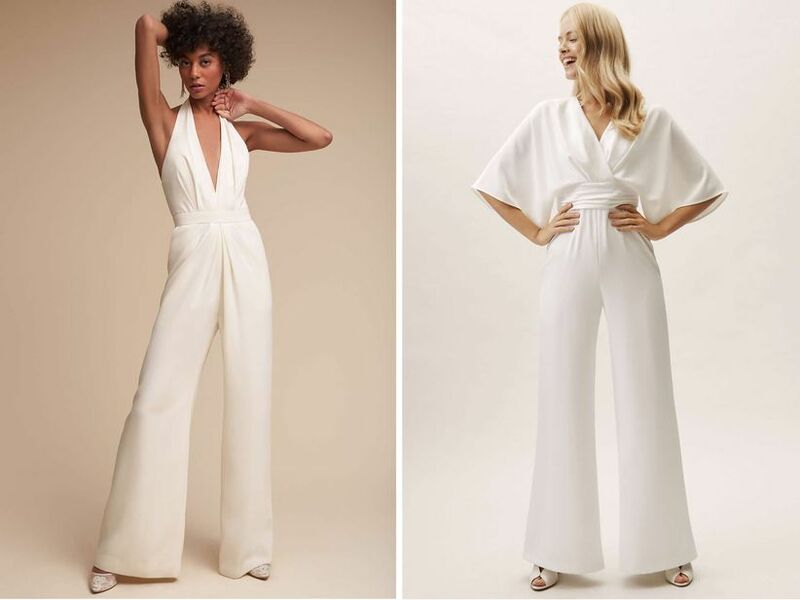 Whether you’re looking for rehearsal dinner attire or perhaps an outfit change at your reception, these bridal jumpsuits are totally made for stylish brides-to-be. Wear one of these bridal jumpsuits at your wedding, rehearsal dinner, or other special occasion. You can absolutely slay your walk down the aisle in this minimalist jumpsuit. Accessorized with a statement-worthy train, Ines Di Santo’s clean, high-neck jumpsuit is meant for edgy brides. The loose-fitting bell sleeves and wide pants on this BHLDN bridal jumpsuit gives off a laid-back, yet sophisticated vibe—perfect for a backyard rehearsal dinner or more casual wedding. Just add statement jewelry and you’ll easily achieve a boho-chic bridal style. Accessorized with a crystal embellished sash, this satin off-the-shoulder jumpsuit is made for upscale events, like your rehearsal dinner or wedding reception. Dare to bare in this low-cut halter bridal jumpsuit. 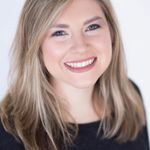 Whether you’re having a formal sit-down rehearsal dinner or modern wedding reception, this garment is a stellar choice for making a statement. With a structured V-neck top paired with a lace kimono-style wrap cover-up, this bridal jumpsuit fits any type of romantic aesthetic. 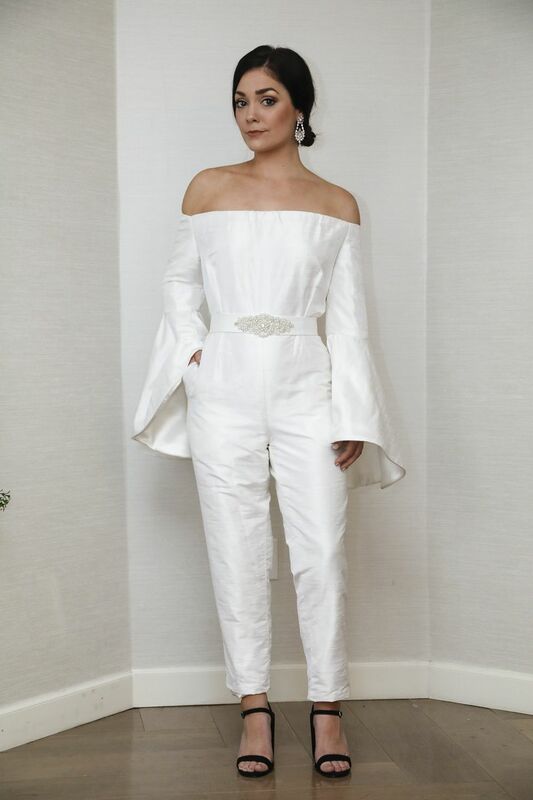 Want to change into a bridal jumpsuit for your after-party? 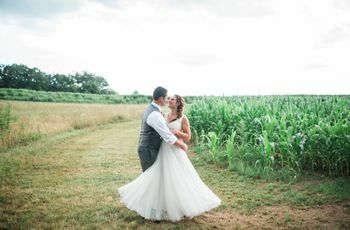 While technically a two-piece option, Theia’s take on the bridal jumpsuit is a fab choice for brides hoping to continue the celebrations in a relaxed and trendy outfit. If you’re having a brunch bridal shower and want to wear a jumpsuit that matches the feminine theme, you’ll love this number. With a ruffled criss cross neckline and a wide leg, you’ll feel like a total prepster in BHLDN’s bridal jumpsuit.